Large Unfold Size: Measures 140 x 170 cm and weight only 160 g. Perfect for a family of 4 use to go camping, picnicking and enjoy the sunshine on the beach. Fit In Your Pocket: With the folded up size 15 x 12 cm in the carrying bag, you may put it in your pocket or hang it in your bag with the hook(comes with the product) and take it anywhere you want to. Dry and Clean All the Time: Water resistant, sand resistant and puncture resistant, all your belonging will be dry and clean and what you have to do is enjoying yourself. Clinging on the Beach and the Grass: With 4 built in corner pockets, you can fill it with sand or push some tent pegs into the loops to keep it down on the beach or on the grass. More Than A Simple Beach Blanket: Our product is all weather friendly and can be used for backyard picnic, hiking, recreational park get away, private sun tanning, beach party and more. 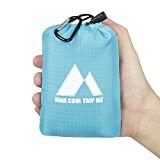 MarCoolTrip MZ Pocket Blanket is made of 100% lightweight waterproof nylon, extra large size provide a clean and dry space for you to enjoy your family time. Store in a carry bag, your can easily put it in your pocket and be used on any occasions and you will just feel like take with a cellphone in your pocket. · Multi-Purpose Blanket: Outdoor and indoor friendly; Ideal for beach party, picnic, outdoor, hiking, grass mat, ground cover and etc. · A basic carry sack for wet clothes or dirty laundry.